Notes: Dunlough Castle, standing atop the cliffs at the northern tip of the Mizen Peninsula, looks at the Atlantic Ocean from the extreme southwest point of Ireland. Founded in 1207 by Donagh O'Mahony, Dunlough is one of the oldest Norman castles in southern Ireland and an interesting example of Norman architecture and dry stone masonry. 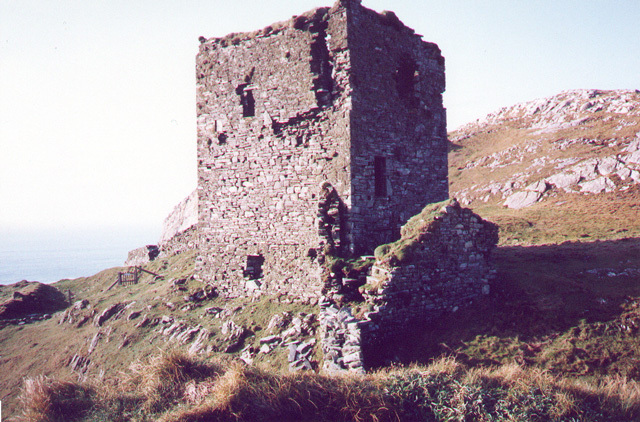 At the time the first Norman soldiers and settlers arrived in Ireland in 1169, the O'Mahonys were the declining but still powerful princes of Eóganacht Raithlind, occupying approximately the area from Cork City west to Mizen Head. Their regional prominence had been diminished greatly since the MacCarthy dynasty had come south from Tipperary in the early 12th century, and faded even more rapidly as the Normans took hold of southern Ireland. Their primary Irish rivals (and allies) were the McCarthys and the O'Briens. But all these groups were militarily outclassed by the Normans who followed in the wake of King Henry II's initial invasion. In 1177, King Henry of England granted "the kingdom of Cork" to the Cambro-Norman knights Robert Fitz-Stephen and Milo de Cogan. De Cogan received the lands of west Cork, and began a push toward the Atlantic which drove regional families from the holdings in central Cork. The O'Mahony clan, led by their chieftain Donagh "the Migrator," settled at the furthest point, the tip of the Mizen peninsula.